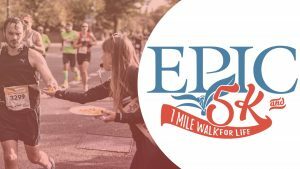 In a huge community-wide effort to support the Eastern Pregnancy Information Clinic, affectionately known as the EPIC Center, we are hosting a 5k and 1 mile Walk 4 Life! Join us in working off those extra holiday pounds and supporting what we do! Our race offers the option to runners for a regular 5K, families to walk a 5K, or anyone to walk at least one mile –all of it to show your support of L.I.F.E (Loving Individuals For Eternity!). These funds will help the center continue to provide free pregnancy testing, limited ultrasound, and pregnancy support services to young women and men in our community who find themselves facing an unplanned pregnancy. We offer prenatal and parenting classes in exchange for free baby supplies. We have the pleasure of serving Craven, Greene, Lenoir, Jones, and Pamlico Counties. Ultimately we’re here to help families thrive! 1 Mile Fun Run – Please contact the office (252-638-4673) for more information about how to register for the fun run. Race-day registration, race packet pick-up, and check-in will be set up under the tent on the school bus lot. Awards will be given to top 3 M/F overall finishers and top 2 M/F age group finishers. Age groups are as follows: 12 & under, 13-15, 16-19, 20-29, 30-39, 40-49, 50-59, 60-69, 70+ (Top overall finishers not eligible for age group awards). All participants who register by April 3rd will receive a FREE EPIC race t-shirt! The shirts are available in Youth S-L and Adult Unisex S-XXXL cut sizes, and are 100% Cotton. After April 3rd T-shirt not guaranteed. AMAZING prize packages for top 3 money raising adults and top 3 money raising youth (12 & under).